A research degree in the Faculty of Biological Sciences is an opportunity to gain and develop skills as an independent researcher in your chosen field. Under the supervision of your lead supervisor and one or more co-supervisors, you will get the chance to carry out cutting-edge research on a particular biological problem and to become part of a large research community using multi-disciplinary approaches to tackle today’s important research questions. Throughout your PhD you will not only strengthen your research skills and knowledge within your research area but also develop skills through our training programmes as well as through attendance as seminars and conferences. 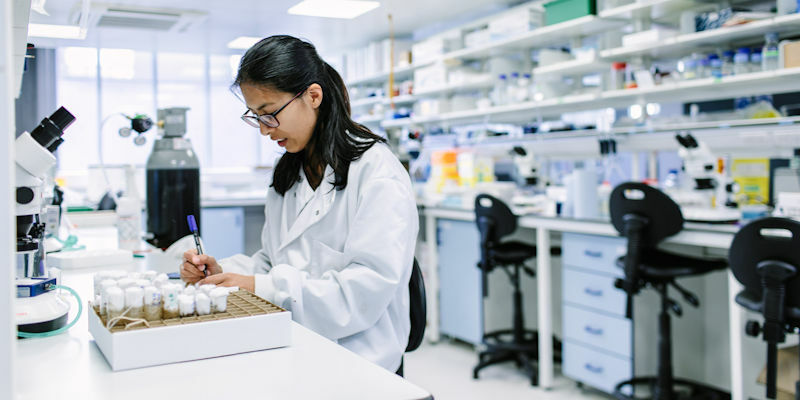 To explore the range of postgraduate research opportunities available either browse the PhD opportunities on offer, many of which are funded, or alternatively browse our supervisor list for more information about the research areas of our academic staff. What a typical full-time PhD looks like? Following application, interview and offer, you will be registered within the school of your primary supervisor. Upon commencing your studies you will be invited to attend a series of faculty and university-wide induction events. These will include ‘Welcome to the University for Research Students’ and ‘Starting your Research Degree’ workshops to help you explore the opportunities and support available to you throughout your PhD. During the first month of your PhD you will complete a training plan to identify your training needs. At four months you will submit either a literature review or Grant Proposal for review by an assessment panel consisting of your supervisory team and an independent assessor. At nine months you will submit a transfer report and be assessed by oral examination. Progression into the second year is dependent on successful completion of this component and subsequent upgrade to full-PhD. Throughout your second year you will further develop skills gained in your first year and as an independent researcher you will build on the research already undertaken and will start gaining results for the final thesis to be submitted either at the end of year 3 or year 4. You will continue to revisit your training plan with your supervisor as well as attend and present at, not only the Faculty Postgraduate Symposium, but external conferences. During years 2 and 3 you may also prepare publications for submission to a journal with your supervisor and other collaborators. At either 24 or 34 months, depending on your programme of study, you will submit a draft paper and thesis plan for review by your assessment panel. Depending on your programme of study you will submit your thesis at the end of either year 3 or 4. This thesis is assessed by an oral examination with a panel consisting of an internal and external examiner.